Strictly designed for the killing of Lion Fish, this mini pole spear measures 27" long plus a removable 6 inch (3 prong no barbs) paralyzer tip, giving it a total length of 33 inches long and packs enough punch to quickly dispatch a menacing Lion Fish. We use a high strength, corrosion resistant, anodized aircraft aluminum spear which will NEVER yield painful fiberglass splinters in the hand (like some inexpensive fiberglass pole spears do when worn down). The connecting joints of the MAKO Spearguns Lion Fish Killer Pole Spear are supported by recessed flush screw on connectors for a smooth release. 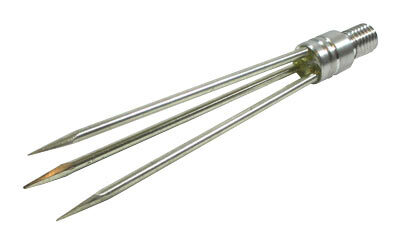 The special 3-prong tip, designed exclusively for Lion Fish, has no barbs so removal of the fish is fast, easy and safe. The MAKO Spearguns Lion Fish Killer pole spear is perfect for travel too. By removing the 3-prong tip, it breaks down to only 27" long. If you like to wear gloves while pole spear fishing, we recommend you purchase a pair of our Cut Resistant, Puncture Resistant, Spearfishing Gloves. 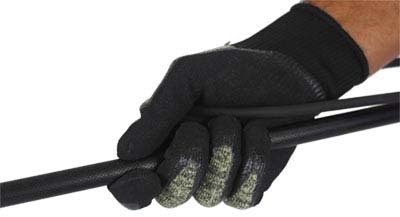 These gloves make gripping pole spears very easy with their non-slip palm and finger coating that also provides excellent cut and puncture resistance when hunting around reefs, wrecks, or targeting lion fish, crabs & lobster. Includes a 3 Prong Cluster Pole Spear Tip with no barbs for fast, safe, and easy removal. Removable Paralyzer Pole Spear Tip for easy travel. Son, Richard Buck, has become a devoted diver, spear fisher and snorkeler. He's never done anything half way and can be counted on to carefully research and identify superior products for his interests. When Rich specified Mako I knew it was the best spear and the best deal to be found, no questions asked...I'm glad he can protect himself from the Lion Fish. Perfect for lion fish. Quality construction and great value for the price. So good that when I lost my first one, 3 other friends had me order ones for them too! Great spear with a good feel! I definetly prefer the aluminum to fiberglass, only minor critique is i wish it was about 6" longer so i could get into some deeper cravasses. Took this spear and tip with me to Jamaica. It is a fantastic. The length, material, construction, and design are all perfect. In 8 days of diving I collected SEVENTY lion fish with this spear and the original tip. The points of the tip are a little banged up now and need to be sharpened, but they held up great. Several other spears of dive buddys had tips break off their spears and didn't get near as many lion fish as my spear did. Now they want one like my mako. Also, if you're considering "barbs or no barbs" on the tips, I really liked the "no barb" tip. I had a few lion fish fight they're way off, but it made it so much easier to put them into a collection container.